Paul Duncan was one of the standouts for the US Revolution team at this year's International Cup. The mobile forward played in five matches for his country in the competition kicking goals against South Africa and China and featured as best player for the US in the match against China. Duncan was this week featured in the Winston Salem Journal - the full article is reproduced below. An issue that began to become obvious over the course of the 2008 International Cup was a growing frustration amongst some nations over the umpiring. Firstly we should note that the umpires were generally Australian umpires from Victoria who had volunteered their time for the tournament, doing their part for international footy, and it was greatly appreciated by those involved. What we're going to discuss here was a relatively minor issue and was primarily an issue of different interpretations. To generalise, the main rules that were causing most cries of discontent from the benches were high contact and in the back when tackling, and holding the ball / incorrect disposal. Additional reporting by Stephen Alomes. 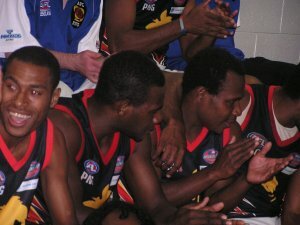 After Papua New Guinea's narrow win over New Zealand in the International Cup Grand Final worldfootynews.com headed down to the rooms to get the thoughts of winning coach Andrew Cadzow, runners-up coach Robert Vanstam, and we also had a quick word to retired AFL champion, PNG's Mal Michael. The biggest single event during the 2008 Australian Football International Cup was arguably the "Dinner with the World" function at the Palladium at Crown in Melbourne on Thursday 5th September. Around 1300 guests attended this glittering evening, with the 16 competing nations and the Multicultural Challenge teams, as well as AFL guests and sponsors. There were a few speeches, the announcement of the World Team, and several cultural performances along the lines of those given by the teams in Warrnambool, as well as one by an Aboriginal group. Looking out across the sea of people gave a sense of just how far international footy has come in the last few years. The event itself would have cost at least AUD$100,000. Perhaps the most significant speech was that of Australian Federal Trade Minister Simon Crean. Late in 2007 there was a change of government and the new one appears to be quite interested in working with the AFL in using Australian Football as a tool for increasing trade with other nations. This can only be a good thing for the development of our sport, and something we should hear more about in future. Although light on detail, you can hear more of Crean's speech in our Youtube video of the night. 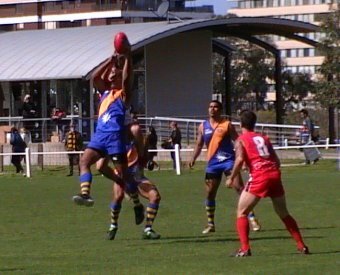 In this author's opinion the IC08 worked so well as a tournament because of the serious commitment of resources to it by AFL Development and because of the efficiency and dedication of a number of people, including volunteer umpires and trainers. We contacted Garry Bilson, AFL Medical Coordinator, as a prelude to writing an article on this aspect of the International Cup. Gary is a Melbourne remedial masseur and trainer with the Brisbane Lions, head trainer at Gisborne FC, a former president of the AFL Trainers Association with VFL/AFL involvements going back to 1978. 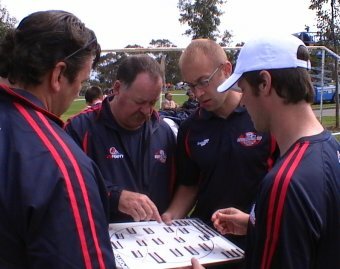 His international football experience includes touring Ireland as Head Trainer for Australia in the International Rules Series 2000, while he has been the co-ordinator of medical services for all three of the International Cups. Garry provided us with this account via an email which we think it is worth publishing "as is". It confirms the general experience of high quality support services at the IC and Garry’s assessment of the "outstanding support provided by the AFL in overseeing this very important area of medical assistance". Some international viewers seem to have problems accessing that site. Certainly I find Internet Explorer works better than say Firefox (which is otherwise my preferred browser). The AFL has released an official review of the umpiring decision that saw South Africa defeat Ireland by a point in the most controversial moment of International Cup history to date. The review included consideration of the statements made by the umpires in interviews with the AFL Competition Managers immediately after the game and also consideration of available match footage. "1. Near the end of the match a free kick was correctly awarded to player number 3 of South Africa for a holding the man infringement. The infringement occurred more than a metre towards the South African goal from the centre square. This is absolutely clear on the video. 2. Having set the mark, the umpire observed the Irish player step over the mark as the South African player came in to take his kick and therefore blew his whistle in response to this action. The umpire immediately decided a 25metre penalty was to be awarded which is correct. This is supported by the video which clearly shows the Irish player clearly in front of the centre square line when the umpire blows his whistle. 3. Conjecture about player number 3 from South Africa playing on is irrelevant as the umpires decision was based on the first action he observed - the Irish player coming over the mark. Whilst it was a dramatic and emotional conclusion to an important match, the AFL is satisfied that the decisions taken by the umpire were correct." Regardless of the official decision, the moment will be talked about for many years to come. We will hopefully have the video footage of the incident online in the near future. Update: We've now uploaded the footage to our worldfooty Youtube player, or visit directly here. PNG vs NZ on ANZAC Day at the MCG? 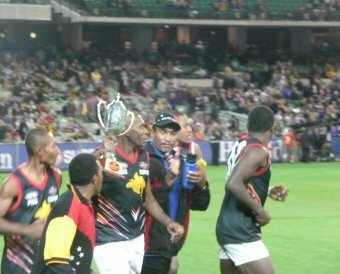 After Papua New Guinea's stirring victory over New Zealand in the 2008 International Cup Grand Final at the MCG last Friday, AFL Ambassador and legend of the game, Kevin Sheedy, headed down to the change-rooms to commiserate with the Kiwis and award the PNG players their medals. His talk included a very exciting prospect for international footy - the possibility of the two teams clashing on ANZAC Day at the Melbourne Cricket Ground as a curtain-raiser to the annual blockbuster between Essendon and Collingwood. ANZAC Day commemorates the sacrifices of Australian and New Zealand soldiers and the annual football fixture has become the biggest match on the AFL calendar outside of finals, with 90,000 fans regularly attending. Many Australians are also conscious of the efforts made by Papuans in World War Two, particularly in assisting Australia defend its northern approaches through caring for injured soldiers. Thus a football clash between New Zealand and PNG is a natural fit for the big day, especially since they are currently the two strongest international Aussie Rules nations. On a personal note, it has always been noticeable that there is not enough emphasis in Australia on the NZ in ANZAC, so this would be a nice remedy for that too. Sheedy appeared to have the support of AFL National and International Development General Manage David Matthews, but did stress there was a lot of work to be done before such a fixture would be a reality, and only put a target date of the next couple of years on the game, so there are no guarantees. Nevertheless, what an exciting step this could be. As pointed out by a colleague, unlike matches such as the AFL final that followed the IC08 Grand Final, a large part of the crowd turns up early on ANZAC Day, often coming from marches and other events, so what a wonderful opportunity to showcase international Australian football - let's hope this match happens. The match to decide third and fourth place was always going to be interesting. Ireland were the inaugural International Cup winners. In their heyday they looked unbeatable with a steady league, players with experience in a similar sport (Gaelic football) and arguably more familiarity with Australian football than their rivals. Their opponents, South Africa had finished last in 2002, fielding a team very new to football, and consequently suffered losses of 162, 27, 77 and 128 points. Six years later things were a little different. The Irish were expected to take a slide down the ladder. Their league at best has been treading water and was only starting to again find its feet. The Warriors had only managed fourth place at the 2005 tournament, and in the years between had lost their first ever match to long-time rivals Great Britain. 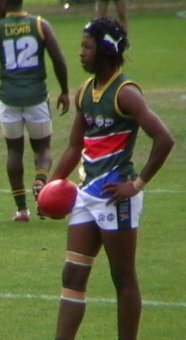 On the other hand AFL South Africa now boasted 14,000 registered players, they had won two games at the 2005 tournament (including their first-ever victory) and for the past few years had played several matches against Australian youth sides, providing invaluable experience. Both countries had been impressive so far at the 2008 tournament. Ireland comprehensively beat Sweden and Finland, and overcame a much-improved Canada. Whilst they went down to New Zealand and missed another shot at the Grand Final, they were by no means disgraced. South Africa too won all their pool matches, and beat the USA for the first time, but were outclassed by PNG in their Semi Final. In the end it took a 25 metre penalty and a kick after the siren, but South Africa won the match by the slimmest of margins, a solitary point. Additional reporting by Brett Northey. The faster and more skilful Nauru overran a Canada which did not give up at Ransford Oval on Friday in their classification match to decide the admirable finishing positions of 5th and 6th. Play on football, faster movement of the ball and faster leg speed, particularly more run off half-back, kept the Nauru team in front. The Canadians moved the ball forward more slowly, while Nauru was able to switch play effectively against their bigger opponents. When the USA team came out of the blocks with early goals and Japan had no reply, it seemed that the writing was on the wall for the Samurai. That was how the game turned out. Lacking four top players from the team which convincingly defeated Samoa, players who had only a week’s leave, undermanned Japan was no match for the stronger and fitter Americans. Perhaps the Japanese had run out of run. Or perhaps McAlister Oval is narrower than Ransford on which they had used speed to defeat the larger Samoans. Certainly the Americans, one of the pre-tournament favourites, delivered one of their best showings of the series. Last Friday saw Denmark and Sweden, traditional rivals in just about every sport ever invented, clash for what would effectively be the right to call themselves reigning champion of Scandinavian footy. After finishing third in their respective pools, Sweden and Denmark had both been defeated in their first-round finals matches, leaving them to play off for 11th spot overall and a lot of pride was on the line for both sides. The Danes have had the edge over the Elks in most tests between the two nations, and went into this match as favourites. Even so, the difference on the day was far greater than the onlookers had anticipated, with the Vikings cruising to a 101-point victory.